It is the time when the plants and flowers start to bloom and the rain starts going away, consequently, it is the month to get married and have a happy and fertile marriage like the plants and flowers. For Balinese, plants, and flowers are very important and they dedicate a holy day to bless the fruits and flowers. They named this holy day Tumpek Uduh and it is the perfect day to bless their land, plantations, gardens, and farms for a fruitful harvest to prepare things and be ready for Galungan festivities three weeks ahead. 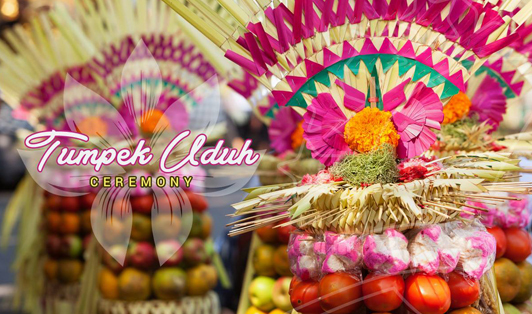 Tumpek Uduh is an important day to Balinese because it is the day to offer respect to plants, trees especially coconut palms which are fundamental and play a huge part in Bali’s economy. Balinese from the south used to dress the trees in Balinese clothes with a scarf and a headband as well as a belt. To notify everybody that blessings are about to come; they hit the tree with a hammer.